The Haitian People’s Support Project is working hard to help the poorest segment of Haiti’s population overcome the hardships of daily life. The sustainable living projects consist of helping people use the resources of their immediate natural environment to sustain and eradicate hunger. Growing their own crops, creating their own sources of energy, developing their own means of employment, and promoting tourism based on the richness and historical and cultural heritage of their areas are examples. Since 1990 HPSP has supported the Lory Pottery Cooperative, located in Lory in the historic north of Haiti. After the earthquake, HPSP purchased 50 acres of land to help develop agriculture in Lory. SOCOP and HPSP are collaborating to develop sustainable living programs and build an orientation center to teach new farming techniques and experimentation with alternative energy materials. This land will be used to develop an eco-village based on sustainable living principles that will serve as a prototype for self-sufficiency and economic development. HPSP has long been collaborating with the Lory Pottery Cooperative, our oldest project. Here they make pots and tiles of all sizes out of their own local clay. They also build brick ovens, which can be used for bakeries and other purposes. The cooperative offers workshops and tours with an historical and cultural emphasis. 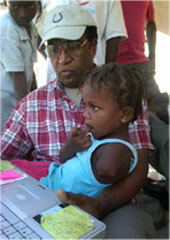 KOFA is a small peasant cooperative, located in the Village of Hinche in Haiti’s Central Plateau. KOFA residents have pooled together their collective resources and with some help from HPSP have managed to greatly improve their lives. The have built their own school, medical clinic, pharmacy and a chair making factory. HPSP is supporting two farmer cooperatives in Haiti’s northern and southern plains. The priority is to grow high protein products to enhance nutrition. HPSP would like to congratulate Food for the Poor, the Lise Antoine Saint-Natus Foundation and the Boca Grande Community for building a new community Bois Neuf just outside of St. Marc, which is about 40 miles north of Port-au-Prince. To date 103 quality homes have been built and are occupied by wonderful families. An elementary/technical school and a community center have also been built. As part of community building HPSP purchased land to be used by the families to grow their own crops. We have delivered Jerrycan water purifiers and French books for the library. ACUNORD is an association of farmers organizations in the north of Haiti near Lory and Cap Haitien. It has been in existence for several years. For the past four years, the Haitian People’s Support Project has been helping ACUNORD acquire more land and build a seed bank. The emphasis is on growing high protein crops such as peanuts and black beans. In return for HPSP’s seed donation, portions of the harvest is donated back to our projects to feed the children. ACUNORD also donates some of the seeds to poorer farmers in their areas. ACUSUD is a brand new organization, following the example of ACUNORD. It was created in February 2011 with the help of the Haitian People’s Support Project and the Haitian Artists Cooperative of Port-au-Prince. It is centered in southern Haiti, in the town of TiGwav, about hours south of Port-au-Prince. It is based on the same principles as ACUNORD.